Spring is here! Apparently Germany has had the hottest, sunniest April for gosh, ages probably. Which makes up for just having one of the coldest, snowiest Winters. The garden has responded by growing into a jungle of thick greenery, with accompanying wildlife! No, it is not a snake, but actually a slow-worm (aka blindworm, or in German a Blindschleiche), a harmless, legless, lizard. When you are deep in the undergrowth pulling up grass by hand and you grab one though, the instinctive reaction is an involuntary yelp! First I found one very long slow-worm (about half a metre long) in a burrow amongst the roots. 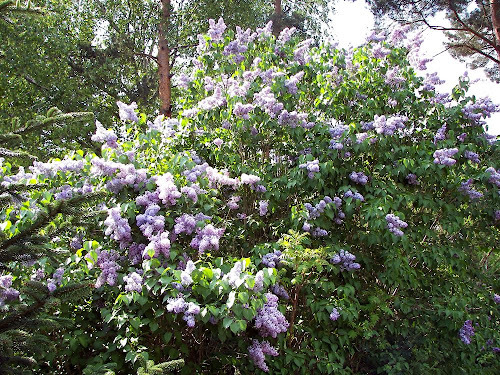 I took it away from the garden and found it somewhere to live in the woods. When handling it, I found the skin smooth, dry and cold. It had very strong muscles and writhed under my grasp but it didn't try to bite me. Subsequently I found another four smaller (about 20cm) ones. I guess the large one was the mother, and these were her off-spring. I let the smaller ones wriggle off to find somewhere safer from the aggressive weeding. My Beloved was horrified, and now I have to do all the digging in the garden in case there are more! I think they are kind of cute though, with blinking eyes (a sign that they are not snakes, which have lidless eyes) and a flickering, forked tongue. They aren't the only unexpected wildlife we've found in the garden; earlier in the year we were strimming a hummock of incalcitrant grass back and found a hibernating hedgehog. 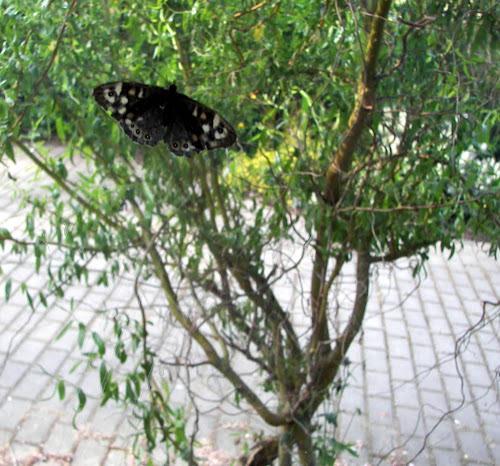 We moved it to a snug place under a pile of cut-down fir-tree branches, and now he is not there so hopefully he survived the Winter and has moved on. 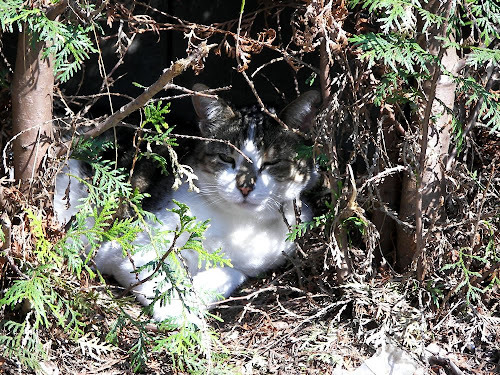 Not that the cats are bothered; they are just enjoying the sun (like Tosca here)! 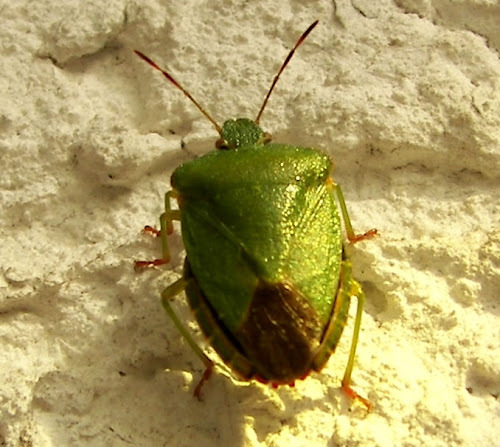 It turns out that the strange-looking bug is called a Grüne Stinkwanze, or green stink bug. And apparently they do excrete a foul-smelling liquid if mis-handled. Stay away cats, this is not a toy!